Pictured below is a 12V low voltage disconnect circuit with a low battery warning buzzer. We sell a wide range of low voltage disconnect circuits in the REUK Shop as well as producing many bespoke LVDs on request. This particular circuit is based around our standard user programmable mini 12V low voltage disconnect, but enhanced to have a buzzer which sounds for one minute when the low voltage disconnect is triggered by 10 continuous seconds of low voltage measured on the battery. This warns the user that they need to take measures to recharge the battery. 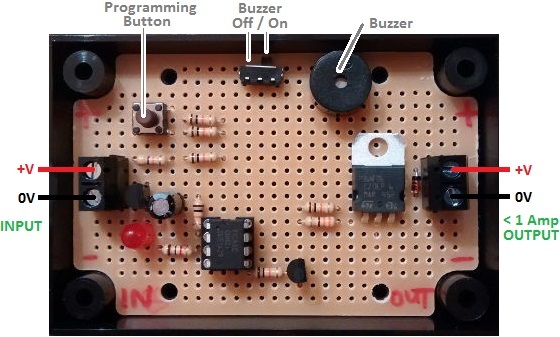 There is also a switch on the circuit board so that the buzzer function can be turned off when not desired/required. If you need any kind of low voltage disconnect, please email neil@reuk.co.uk with details of your requirements.